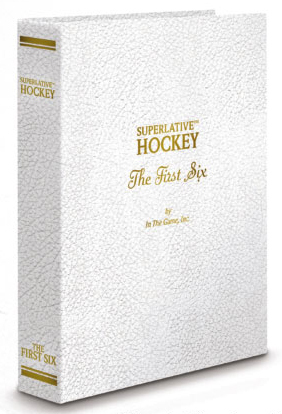 2013 ITG Superlative The First Six is a high-end look at hockey's Original Six franchises. The all-hits configuration delivers a total of seven autographs and memorabilia per box. Each comes from either the Detroit Red Wings, Chicago Blackhawks, New York Rangers, Boston Bruins, Toronto Maple Leafs or Montreal Canadiens. Autographs are all on-card, save for Papercuts cut signatures. Basic autographs fall one per box. 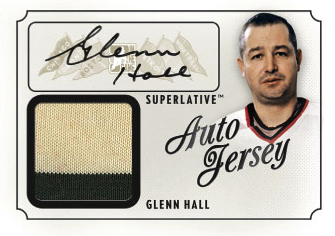 They're joined by both an Autographed Game-Used Jersey and an Auto Plus card, which has a memorabilia piece. Lumbergraph signed stick cards are randomly inserted. 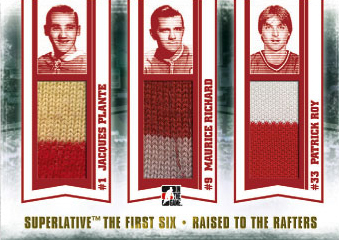 Like most other In the Game products, 2013 ITG Superlative The First Six Hockey has a variety of memorabilia sets. These range from regular single-swatch Game-Used Memorabilia cards to Quad Memorabilia cards. Both fall one per box. There's also a Trophy Case memorabilia card that comes with a variety of relics. The final card of the box is either a Papercuts, Lumbergraph card or an additional memorabilia card. 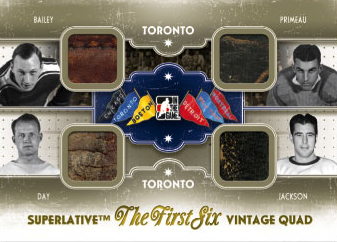 In focusing on the Original Six teams, there's a lot of history in 2013 ITG Superlative The First Six Hockey. 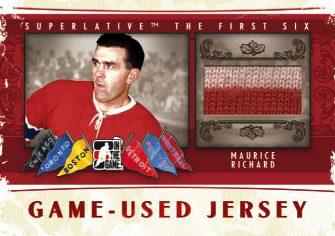 Maurice Richard, Gordie Howe and Patrick Roy are just some of the legends in the set. 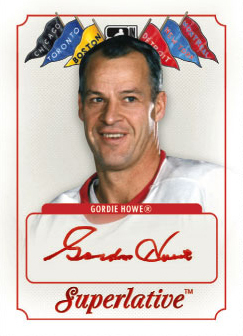 Click here to see the 2013 ITG Superlative The First Six Hockey checklist.